Cleaning your house everyday is a time-consuming job itself – upholstery cleaning is something different altogether. Like any other material, your seat covers and furniture gets dirty too with vermin and dust making it their hometown and vacuum cleaner ruining the situation even more. All that you do to clean it doesn’t help it; in fact it damages the fabric and shortens the life of your upholstered furniture. 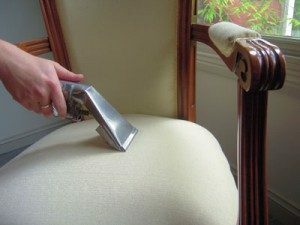 The best possible action in this scenario is to get professional help and let the experts clean your upholstery for you. We are Cleaners Putney and deliver professional upholstery cleaning solutions in Putney, SW15 London. Upholstery cleaning is not something you can pass on – the dirt can cause allergies and your furniture might even stink. In order to protect it from wear and tear, you need to clean it and clean it with care. And to perform the task effectively, we use steam cleaning method which is although powerful but not harmful for the fabrics. Even our cleaning products are mild and effective but bio-degradable. Before starting the process, our cleaners will inform you about the time duration of the procedure. Cleaners Putney can send professional upholstery cleaning technicians at your place whenever you need them. Proficient and efficient, we provide you the best cleaning service in Putney, SW15 London without damaging anything you own. It is a rule to not even change the living arrangement while we do our way – you will find your curtains just the way they were before. Although our experts can deal with any material – sofa covers, dining table chairs, ouch or blinds, they leave behind tough stays if they think it will damage the fabric. If your rug is too old to treat or could only be dry cleaned, our cleaners will give you some tips on how to maintain it rather than causing any harm to them.